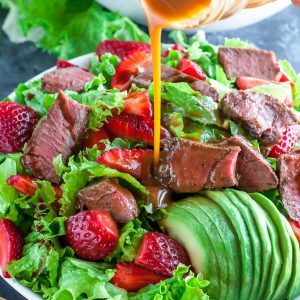 Ready in under 25 minutes, this Strawberry Steak Salad with Homemade Balsamic Dressing is quick and easy enough for lunch or weeknight dinner! It's a little bit sweet, a little bit savory, and a whole lot of deliciousness in every bite! Recipe yields 2 meal-sized salads or 4 smaller side salads. 8-10 oz fresh strawberries as many as you'd like! Pat steaks dry and season with salt and pepper on both sides. For best results, allow steak to come to room temperature before cooking. Heat a drizzle of oil in a large cast-iron skillet over medium-high heat. Add to pan and sear until browned, approx. 2 minutes for the first side and 1 minute for the second side. Using a potholder, place skillet, steaks and all, in the oven for 2-3 minutes, or until desired internal temperature is reached. If using steaks larger than 6 oz each, adjust times as needed. Remove from oven (potholder! grab one!) and place steaks on a plate. Cover with foil and allow to rest for 10-15 minutes. Resting is crucial for a juicy steak and gives us ample time to make our salad and dressing! Chop your lettuce, strawberries, and avocado. Drizzle avocado with lime juice and/or oil to keep things gorgeously green. Combine dressing ingredients in a mason jar and shake well. Feel free to adjust levels of balsamic and honey to taste. The above measurements are my dream combo! Once rested, thinly slice your steak into bite-sized pieces. Toss together greens, berries, and avocado then top with your steak. Drizzle with a little of the dressing and dive in! * I used ruffled looseleaf lettuce for my salad but your favorite green variety or combo will also work great! Spinach and Romaine would work fantastic together or even packaged spring mix! ** To prevent/delay avocado from browning, top sliced avocado with a squeeze of fresh lime juice and a drizzle of avocado or olive oil. Firing up the grill? Glorious! Absolutely feel free to grill your steaks for this salad. optional extras: goat cheese or crumbled feta, roasted or blanched asparagus, green beans, caramelized onion... Have fun with it! Dressing adapted from Sheila's Balsamic Dressing. Nutrition Facts below are estimated for the salad using an online recipe nutrition calculator. Dressing is approx. 130 calories per serving. Adjust as needed based on extras and dressing added and enjoy!